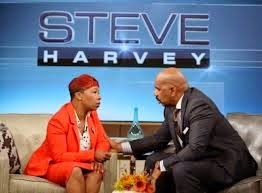 Michael Brown’s mother Lesley McSpadden appears on the next episode of Steve Harvey to talk about how her family is coping with their loss. “Have you found comfort in anything?” asks Harvey. “Prayer, and my other children,” says McSpadden, who lost her son this summer in Ferguson, Missouri. Harvey also invited a clinical psychologist on to the show to discuss how to overcome grief. Tune in to Steve Harvey tomorrow, Tuesday, September 30.